It occurred to me the other day that I haven’t done any cooking/recipe posts lately. Not because I don’t cook, or because I want this blog to be exclusively reviews, I just find it painful to photograph while cooking! So I thought I’d fill you in on what I’ve been cooking lately. This is a faboosh recipe I adapted from the ever lovely Bill Granger. I love it, as it’s super simple but also because it’s low fat and low sugar. I always make sure I have a couple of bananas ripening away or in the freezer ready to churn out this classic recipe. It’s also super adaptable. The original is dried apple and cherry, but I’ve also done a fig version and a frozen berry version. 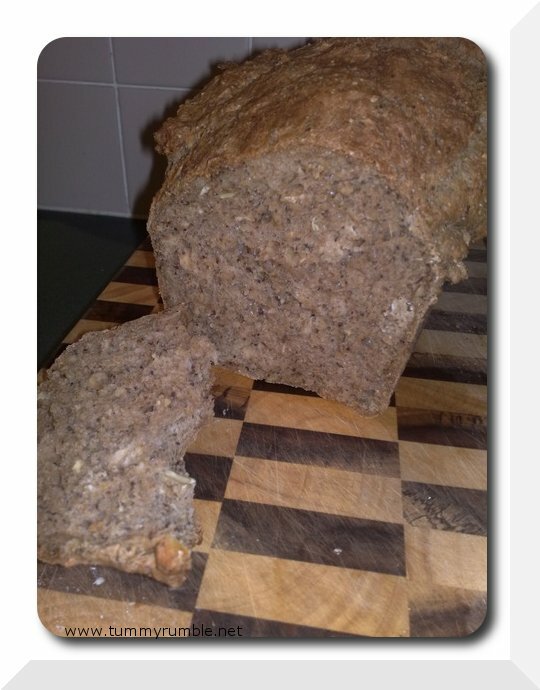 Virtually any fruit flavouring works well in this loaf. It also freezes wonderfully. Yet another bready/loafy type recipe to help me use up apples and other firm fruit. So far I’ve used apples and pear, and apples and frozen berries.This recipe is also pretty healthy using vegetable oil instead of butter and needs very little sugar. Care of twitter I’ve found out about many a tasty treat and one of the best has to be this vegan chickpea blondie by the lovely Celine of Have Cake, Will Travel. I love this recipe as it makes me feel less guilty. I’ve tried with both the tahini and the peanut butter and in my second attempt at making it, I cut the amount of sugar and it was still delicious! The other week after a visit to Eveleigh Markets I ended up with a whole little pumpkin. I looked at it for a while trying to figure out what to do with it. Eventually, I just threw it into a hot oven whole and baked it until it was cooked through. It sat, cooked, for another day or so before I remembered that I had some lovely Small Cow Farm Fetta cheese sitting in the fridge from that wonderful deli bag I bought at the Royal Easter Show. I also had some filo pastry. There it was: Pumpkin, fetta, baby spinach and pine nut parcels. Cube the pumpkin and fetta, and mix with toasted pine nuts and softened spring onion, then lay some baby spinach on the filo and put about 2 tablespoons of the pumpkin mixture on top and roll up into a neat little parcel. Bake in a moderate oven for about 15 minutes, and voila, easy peasy vegetarian meal in minutes! Also froze some uncooked for super quick weeknight dinner. Another recent pick up was a custard apple. Very in season and on sale at Woolies for $4.95 per kilo. It sat in my fruit basked for a week and then I picked it up and realised that it was super ripe. In fact it was so ripe my finger went through the skin in some places. I had no idea what to do with it having only ever eaten it raw. So I did some Googling and in combination with the already prepared rhubarb I had in the fridge set about a crumble. Really, the hardest part was removing the seeds. I divided the custard apple and rhubarb between two ramekins, then made a crumble topping of brown sugar, oats, almond meal and pecans…baked for about 20 minutes and done..bliss! 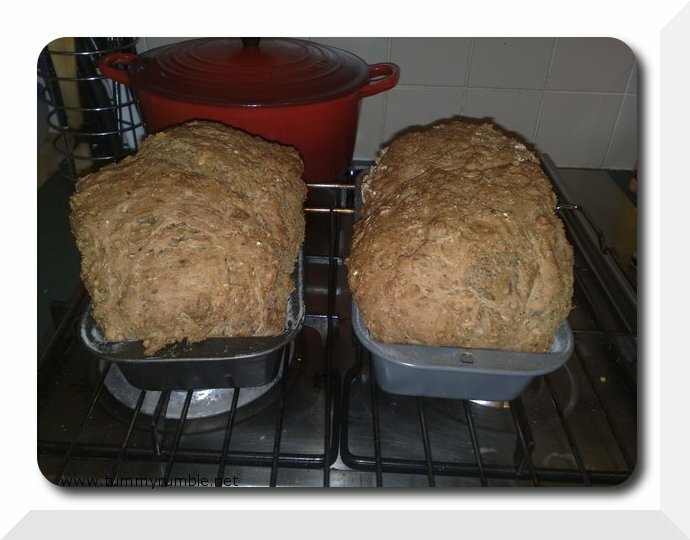 I had a great time recently attempting a bread recipe I’ve been hoarding for ages! This “Healthy Loaf” sent me spare! I made the whole recipe and after spending a day looking for wheatgerm and molasses (I ended with treacle) I set about the task. I should have trusted my gut and only attempted to make half the recipe. All seemed OK at first until it came time to add the water. First the treacle and golden syrup just sank to the bottom of the jug. Then when I started pouring it into the dry mixture I had the horrifying realisation that it was too much! Abort! Abort! I ended up with only a fraction of the water/treacle mix required, and ended up having to add heaps of oats, more wheatgerm etc to try and soak up the moisture. Then, when I came back to check on it’s progress I found that the mix had climbed out of the bowl! After scraping up the detritus, I gave up at this point as the dough was too sticky to knead or do anything to, so I chucked it into the loaf pans and baked. Surprise, surprise! it worked, beautifully in fact! Now I haven’t yet attempted it again, but I will. That’s what I’ve been cooking, now tell me what have you been cooking? @ Little Red Hen Seriously addictive. DO NOT TRY THIS AT HOME! I’m glad I’m not the only one that finds photography/blogging while cooking a real pain in one’s side. For me, cooking wise, there’s nothing really worthy of note. Usual sort of fare like making pesto, a couple of attempts of a vegetable broth, one of which was with homemade vegetable stock & a boscaiola sauce recently. @ Nic yes, when *is* your blog going to see the light of day? Blog taking time to develop, unfortunately 🙁 Working with a graphic designer who had to delay theme design for a bit. Building content and functionality in the meantime. I hope that somewhere mid-June will see birth of it. Agree with the photographing whilst cooking issue – hate getting my cameras dirty with sticky hands! I tried making corn fritters this morning but put too much flour in and they turned into corn pancakes. Epic FAIL. Trying to redeem myself tonight with hearty minestrone with chunky garlic croutons and a side of roasted tomatoes stuffed with AC butchery beef and tomato sausage and melted gruyere. Fingers crossed. I just made a yummy grape cake but I think my next endeavor might have to be the chickpea blondies! Oh wow I like the sound of the Custard Apple and Rhubarb Crumble. And yeah, we don’t take photos of the cooking process and usually just stick to the finished product! I tried to cook macaron the other day but that was an epic fail. They looked more like fried eggs. I usually don’t comment on blogs, but this recipe changed my opinion. I just write to say thank you!